You better make sure that Rose is with Emmett and Nessie! You don't know what bad habits she will acquire, in his care. And you worry about me? EDC Inc~New Trainee Supervisor~Team Emmett! MS Virgin & Randomness Irregular! Edward Cullen, you get your child away from that vampire this instant! I can't see your daughter, but I'm pretty sure she and Emmett take paint to the family's wardrobes. Yep, skunks and paint, and I can't see who did it. If my clothing gets ruined, I will shave you bald! 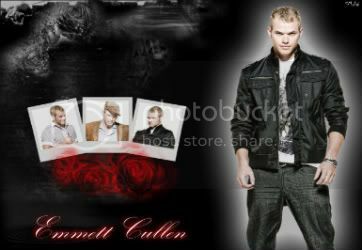 Sorry I can't control what Emmett does. But I will tell Renesmee not to do such a thing. You can help Jasper & Emmett look after you adorable niece. Of course I worry about you. What father wouldn't? My favorite band Pierce the Veil. I LOVE VIC FUENTES!! Thank you so much Chloe for the banner.